When we arrived at our first stop for wild plant hunting on Guernsey this very rare plant was growing in a piece of waste ground near the sea wall. 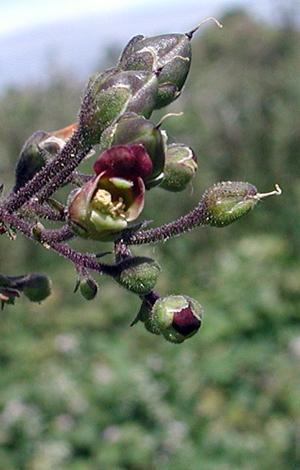 At first you have doubts that this can be the rare figwort because the flowers are much the same as other figworts. Then you look at the leaved which are different. Although Scrophularia scorodonia is not given a rarity rating in New Flora of the British Isles edition 3 (it was RR in the other two editions, it is found only in Cornwall, around Gloucester and the Channel Islands in any quantity. It is naturalised in a few other places but there is very little in the rest of England, Wales or Scotland. It does nor occur in Ireland.